Doha is a hugely dynamic city which takes its range of sightseeing attractions seriously. 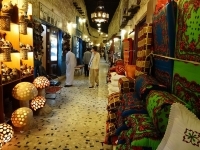 Shopping and eating out are extremely worthwhile activities in Doha, where ultramodern malls, glamorous restaurants, and bustling markets called souqs combine to offer a melange of traditional and modern food and retail opportunities. A stroll along the Corniche (promenade) at sunset is another must in Doha, allowing travellers to see the glittering coastal city at its best. Doha has a range of museums and galleries offering respite from the desert heat, some of the most popular include the National Museum and Doha Fort. The Ethnographic Museum and the swords and knives on display at the Weaponry Museum are equally fascinating and offer visitors a glimpse into the history of this proud country. The undisputed gem of Doha's cultural scene, however, is the Museum of Islamic Art. Some enticing excursions out of the city are made possible by numerous tour operators, with camel rides and racing events and dune boarding good options to explore the stark beauty of the seemingly endless stretch of desert beyond Doha. There are also some interesting smaller coastal cities and towns within easy reach, for those who want a taste of Qatar's more traditional face.